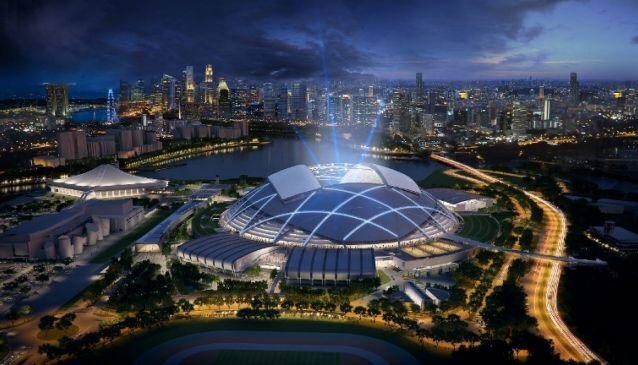 A 35ha development, the Sports Hub is drawn up as a pedestrian network that responds to the water's edge of Marina Bay, the adjacent highway, the existing Singapore Indoor Stadium, and transportation entrances. The Sports Promenade, which is a covered promenade open to all at all time, connects the National Stadium with other facilities within the complex. This includes a collection of plazas and recreational facilities, distributed across the site to offer multi-purpose, civic gathering places. The Sports Hub includes 41,000sqm of retail space, the 6,000-seat indoor OCBC Aquatic Centre, a 3,000 seat multi-purpose indoor OCBC Arena, a Water Sports Center, and additional sports and leisure facilities, the Sports Hub Library and Singapore Sports Museum. Sports Hub won the Best Sports Building award at the 2014 World Architecture Festival.